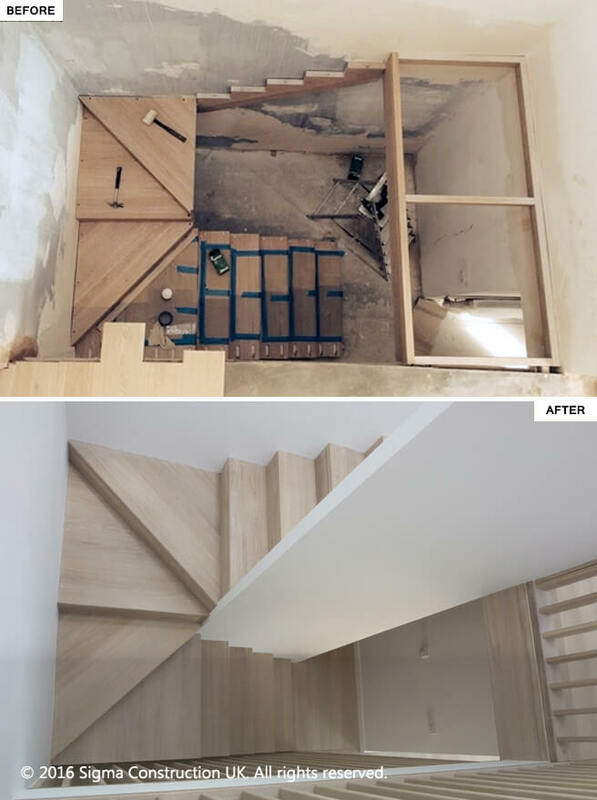 The renovation of this four-bedroom, three-story house St John’s Wood was undertaken by Sigma, a construction company based in London, for an international investor. The use of light colors throughout the house, as recommended by Sigma, added a light, yet substantial feel to the interior. The flooring installed by out London builders team was very contemporary, with the use of engineered oak timber combined with Carrara marble and a white lacquered finish on all the joinery. The fresh colors combined with the clean cut lines on the joinery gave this house renovation a lavish look to meet our client brief. The kitchen we designed was fashionable and sleek, with subtly contrasting, custom-made units, and a light-grey marble-effect for the splashback and island counter. And in order to add a bit of warmth and ambiance to the kitchen, integral under-cabinet LED lighting was employed. The rest of the lighting was kept simple, with spotlights across the room and two pendant lights above the kitchen island. To allow as much light into the home as possible, Our London builders installed full–height, floor-to-ceiling windows, which gives any guests using the first-floor bedroom a marvelous view of the newly landscaped garden, with its lush greenery and water feature. 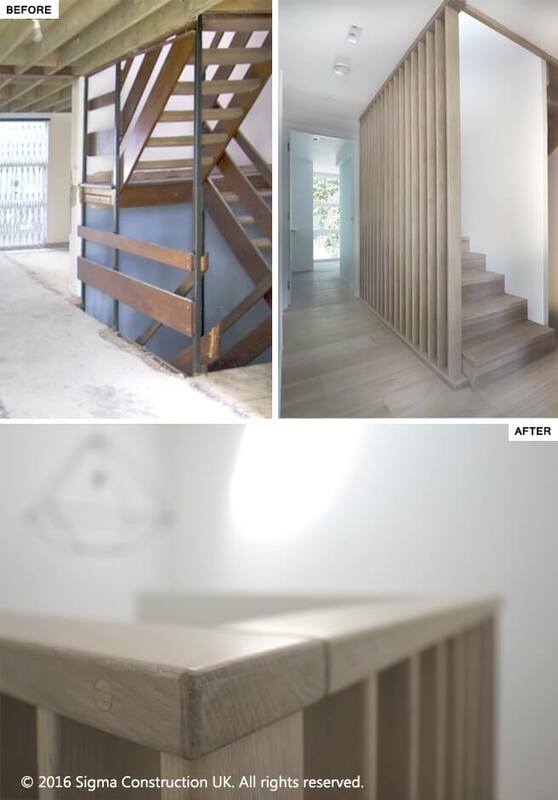 To blend the ground and upper floors, a similar color palette was used throughout, with solid oak on the central staircase and a vertical feature batten wall, which very effectively divides the space without completely closing it off, but also adds a modern look. The en suite design in this London NW8 renovation, whilst still using a neutral color palette, offers more contrast. We created this by using darker tiles mixed with light walls and chrome sanitary ware, adding a masculine dimension, yet still in harmony with the rest of the house. 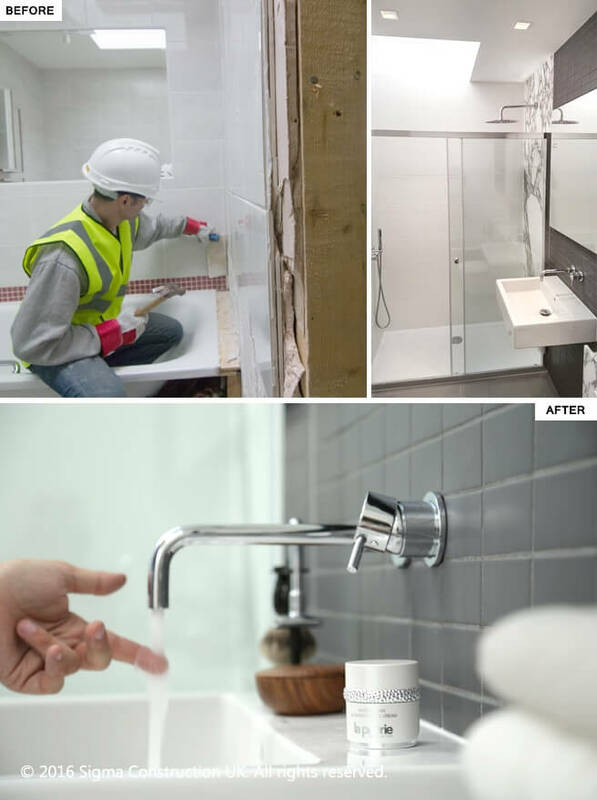 Sigma Construction UK also installed an Arabescato marble vanity unit and combined it with matte-finish, micro-brick porcelain mosaics on the wall and larger brick semi-glazed tiles on the floor. The shower is very simple, with a full-height mirror and a chrome border. The high ceilings and skylights allowed our team to introduce a darker palette here since there is more than enough light coming in to make the bathroom feel very spacious. The carpets in the upper-bedrooms give them softer look, inside the rooms. 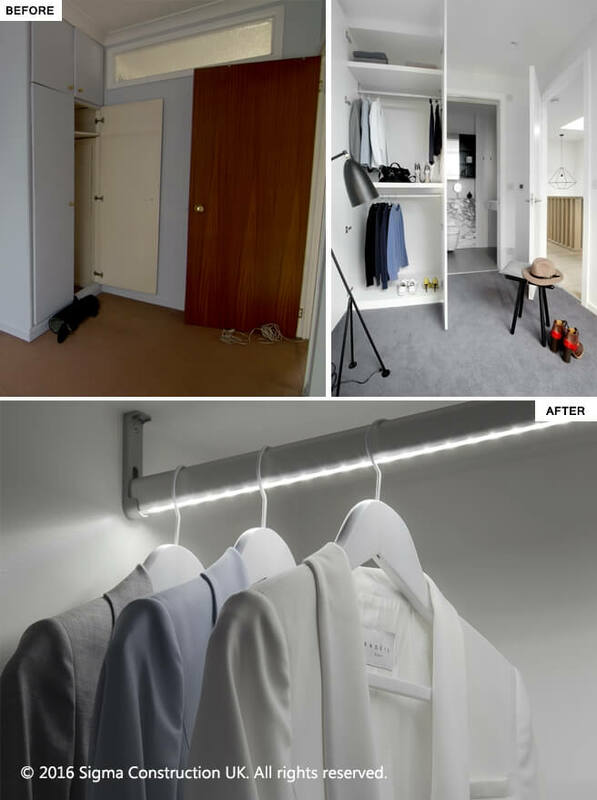 The wardrobes have been fitted with illuminated clothing rails, which add a designer accent and glamour to our client's home. At Sigma Construction we constantly challenge ourself to deliver exquisite and luxurious home renovation beyond of expectation of our client. With every home renovation we cover all areas of specification, including choice of most appropriate furniture, lighting, fixtures and fittings. Furthermore we help our clients with layout arrangements and internal space planning. We are in the top 100 construction companies in the UK, within the London builders’ directory, of which some of whose entries include Balfour Beattie Construction, Carillion UK, and B&G Construction UK. Sigma Construction aims to deliver a high-quality design service tailored to each client’s brief. For example, among the properties found across Zoopla, Rightmove and Gumtree UK, we are able to offer a personalized design service to fit your requirements. Only well-established building companies in London like our self with a proven track record within high-end property refurbishment sector can deliver truly stylish and contemporary luxury homes in predominantly exclusive areas of Central London, St John’s Wood, Hampstead Heath, Kensington and Notting Hill. Building companies in London complete many average looking homes on London market. Properties realized by Sigma Construction UK team of technical and creative experts achieve exceptional sale value and are widely sought after. 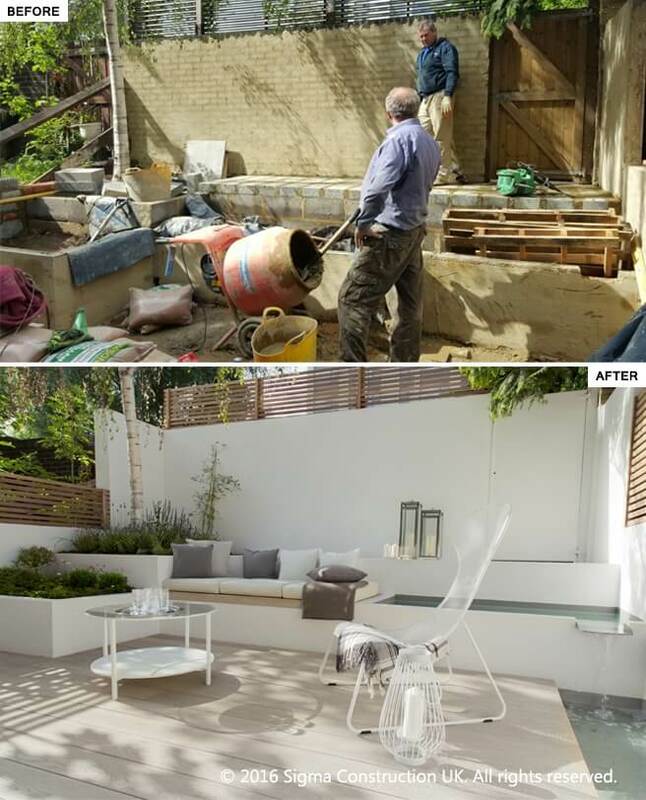 We have been involved in many house renovations across London and the UK. 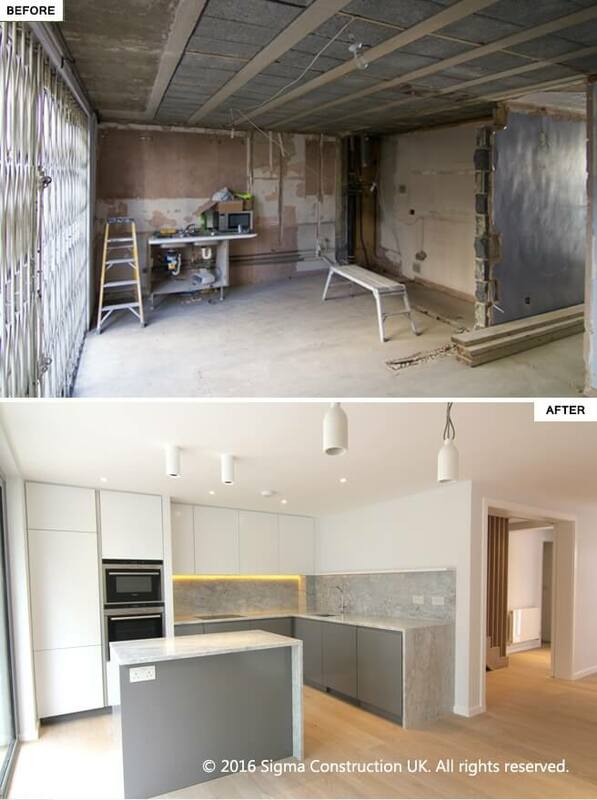 We are proud to share our work, and showcase our house renovations both before and after, as this lets our potential clients see what we are capable of, and the what a positive impact our designs can have on your new home.